As the temperatures drop in the mountains, it is time to prepare your outdoor watering systems for winter. Yard irrigation systems and hose bibs need to be ready for freezing temperatures to prevent damage to plumbing. Hoses that remain connected to frost-free hose bibs can cause the internal workings of the hose bib itself to become damaged. 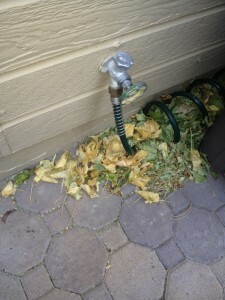 Time to disconnect hoses and shut off the water to any non-freeze protected exterior water sources. If you are not familiar with the necessary steps to take to get your irrigation system and other outdoor water sources such as water features ready for winter, contact a qualified landscaping company that offers irrigation winterizing services.